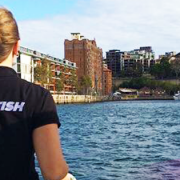 There are a number of reasons to consider hiring your own private catamaran to sail on Sydney Harbour with. If you have a special occasion or a big event coming up, you may be thinking of different ways to celebrate, rather than the usual night out or hired venue in and around the city. 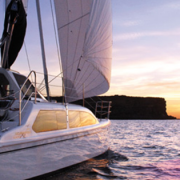 Many people dream of owning their own boat and, with Rockfish private charters, this dream can become a reality, even if it is only for a few hours! This will affect the size of the boat that you need. 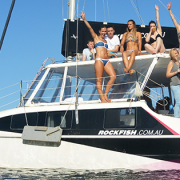 The Rockfish catamaran can take up to 30 passengers so if your party crowd is bigger, we may have to steer you in a different direction. 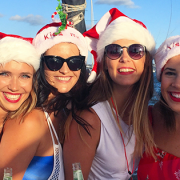 Whether it is nice and hot and you think everyone will be outside for the duration of the charter, or your party is due to take place in the cooler months, you’ll need to be confident that there is enough space for everyone in your party, regardless of the conditions. Rockfish has a good sized indoor space should you need shelter from the cold (or if the sun gets too much!) and we have a large outside area that comfortably fits everyone, even if the boat is at full capacity! What entertainment do you want/need? If it is a buck’s party or a hen’s party that you are organising, we do have entertainment packages available, please just ask about them when you call to book. We do have a great sound system available that will connect to an iPod and has both internal and external speakers … if you’re looking for a dance floor though, we technically don’t have one but that’s not to say you can’t make one where you’re standing! What will everyone eat and/or drink? Rockfish do provide catering packages if you need us to, again, just ask about it when you call to book or enquire! If you wanted to make use of the BBQ on board and BYOP drinks however, you are more than welcome to! We have 2 large eskys on board to store any food and drink until you’re ready to in! Where’s the best place to start the party? 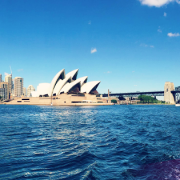 With people coming from all over Sydney for your party, it can be hard to find a place that suits everyone when it comes to meeting up or finishing off. Bear in mind where people are and whether or not the pick-up/drop off points are easily accessible for them. We have multiple pick-up and drop-off points available and we can stop off at some points too if you need to pick up different people from different places. Just let us know before the big day and we will do our absolute best to accommodate for the needs of as many people as we can! 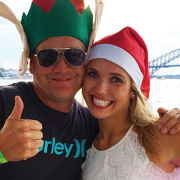 Rockfish have helped so many people plan their special event over the years. 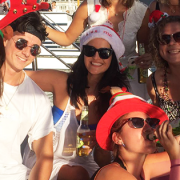 Whether it’s a birthday party, a hen or bucks party or just a lovely day out with your favourite people, we make sure that the experience you have on our boat is one you’ll be talking about for a long time after it has finished! We’re really proud of the experience we offer and we hope that you’ll agree it was fun. If you want to tell other people about it afterwards … even better! A new addition to the Rockfish Family!